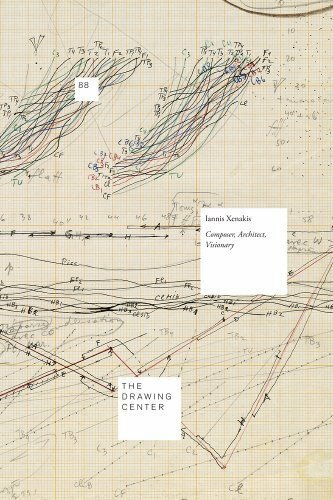 Published on the occasion of The Drawing Center’s exhibition, Iannis Xenakis: Composer, Architect, Visionary explores the fundamental role of drawing in the work of Greek avant-garde composer Iannis Xenakis (1922-2001). A leading figure in twentieth-century music, Xenakis was trained as a civil engineer, then became an architect and developed revolutionary designs while working with Le Corbusier. Featuring nearly 70 color plates of archival images and documents created between 1953 and 1984, this is the first publication dedicated to Xenakis s original works on paper. Included are rarely-seen hand-rendered scores, architectural drawings, conceptual renderings, pre-compositional sketches, and graphic scores. The volume, number 88 in the Drawing Papers series, also includes essays by Ivan Hewett, Sharon Kanach, Carey Lovelace, and Makhi Xenakis. Text: Kanach Sharon, Xenakis Mahki et al. pp. 140; paperback. Publisher: Drawing Center, New York, 2010. Request info for "Iannis Xenakis: Composer, Architect, Visionary"